I am a huge fan of out of town gift bags. There is nothing like getting off a plane (or worse, a long car ride) and checking in to a hotel with some treats waiting you. On more than one occasion, we have checked in on a Friday afternoon with just enough time to unpack and get ready for the rehearsal dinner. Back to the OOT gift bags aka Out of Town Gift Bags. Really, they are a godsend. If you have the money but are lacking in the DIY spirit, contact Swell Sweets. They will make your gift bags for you. Another option would be Bagable Gift. 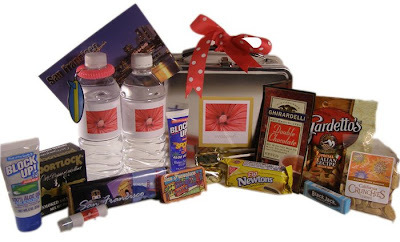 Based in Chicago, the company focuses on making gift bags for your wedding. I really like that they use customized labels to seal up all of the items. Oh, what a great post. 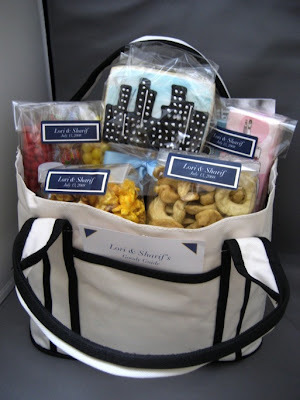 I love out of town bags, they make your guests feel so special!